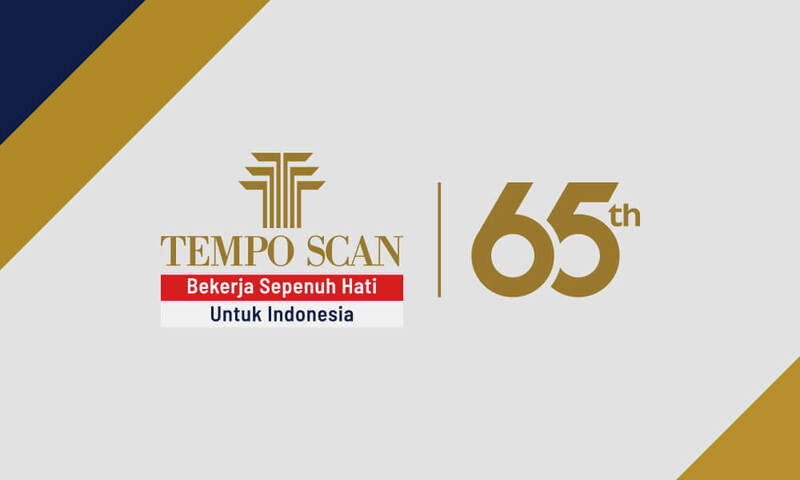 Jakarta, 3 November 2018 – Tempo Scan Group has entered its 65th year as a national private business group with its core business in marketing, manufacturing, and distribution of pharmaceutical, nutritional, cosmetic and consumer products. In this 65th year, President Director of Tempo Scan Group, Handojo S. Muljadi has created a new slogan “Work Wholeheartedly for Indonesia” which is the representation of 5 core values which have so far become the guiding principles of all employees of Tempo Scan Group, i.e. “Honesty, Hard Work, Equality, Responsibility, and Usefulness”. Handojo S. Muljadi explains that it is not an easy feat for a company to have 65 years of existence, and the next challenge for Tempo Scan Group is how to keep continuing to the 100th year. The key is success in developing and maintaining the company’s mainstay, which is the Employees of Tempo Scan Group who have committed to Work Wholeheartedly both for the company and for Indonesia. Only with the support of all the Employees of Tempo Scan Group Working Wholeheartedly can the foundation of strong human capital with “3C” - Commitment, Capability & Creativity be made real. In the 65-year business journey Tempo Scan Group has managed to produce, market and distribute Indonesian products of excellence, quality and benefits. Such success has been achieved among others by developing domestic manufacturing industry in order to reduce dependence on imported products. Its commitment has been realized by building the 9 (nine) Tempo Scan Group factories which manufacture pharmaceutical, nutritional, consumer, and cosmetic products. All those factories are located in the territory of the Republic of Indonesia, utilizing modern technology and managed by the generation of Indonesia. In addition, Tempo Scan Group has also realized its commitment to build distribution and logistics network, spread to more than 100 cities and regencies throughout Indonesia, as branch offices and sales points, supported by ERP SAP based Information Technology, to run an integrated distribution chain. The distribution and logistics network is also under the auspices of the transportation fleet owned by Tempo Scan Group to improve the level of delivery service for its approximately 100 thousand customers. Next, with the swiftness of Digital Revolution 4.0, Tempo Scan Group’s loyal customers can also purchase the products through Tempostore.com. vidoran powder and liquid milk for children growth, produced and marketed by Tempo Scan Group with affordable prices to help low economic parents get quality milk with the right nutrients for their children. Vidoran products are the real form of commitment of Tempo Scan Group in helping Indonesian children to get equal opportunities in getting the best education with the right nutrition. On its 65th anniversary day, Tempo Scan Group held a range of activities not only to introduce the new slogan, but also to launch the renewed company’s official website, as a means of interaction between the company and Indonesian society. Much information about the Corporate Info, Investors, Products & Services, Business Opportunity, and Career is much easier to access. Website of Tempo Scan Group can be accessed via www.temposcangroup.com. The event was closed with a symbolic donation from Tempo Scan Group employees to the victims of disasters and places of worship in Lombok dan Palu, and as a form of care the company, Tempo Scan Group, has multiplied the amount, so that more people can receive the benefits. All these tangible results have been achieved thanks to hard work guided by the principle of equality. “Working Wholeheartedly is our strength to keep giving the best for Indonesia” closed Handojo S. Muljadi. Tempo Scan Group which was previously known as The Tempo Group is a national private business group consisting of more than 30 companies, part of which are under PT. Tempo Scan Pacific, Tbk as one of the Holding Companies of Tempo Scan Group. This group has its core business in Manufacturing & Marketing of Pharmaceutical, Nutritional, Consumer & Cosmetic Products, as well as in Distribution & Logistics Services, and Property & Financial Services. Tempo Scan Group business activities commenced with the establishment of PT. Perusahaan Dagang Tempo on 3 November 1953, engaged in the field of Pharmaceutical Products trading. Then, it expanded its business to manufacturing Pharmaceutical Products with the establishment of PT. Scanchemie in 1970. Next, Tempo Scan Group furthered the business to trading and manufacturing of Cosmetic and Consumer Products through PT. Barclay Products in 1977 and PT. Rudy Soetadi at the beginning of the 80s. In anticipating its fast growing business under the leadership of Dian P. Tamzil and Handojo S. Muljadi, Tempo Scan Group conducted a restructuring process in 1991, to sharpen its business focus on the core business comprised of producing and marketing Pharmaceutical Products especially OTC (over the counter) drugs, Consumer Products & Cosmetics, as well as providing Distribution & Logistics Services. Through the restructuring process, all business activities unrelated to the core business were terminated, and PT. Scanchemie, as the Holding Company, ran its core business, during which the company was renamed PT. Tempo Scan Pacific. In 1994, as a part of the restructuring process and also in order to improve transparency of financial statements and management activities, PT. Tempo Scan Pacific went public and became a public company named PT. Tempo Scan Pacific, Tbk (“Tempo Scan”), by listing a total of 75,000,000 shares on the Indonesia Stock Exchange/IDX (formerly known as Jakarta Stock Exchange/JSX). In 1995 the number of shares was raised to 150,000,000 shares by changing the nominal value of each share of Tempo Scan from Rp. 1,000 to Rp. 500 per share (stock split). In 1997, Tempo Scan did not escape from the storm of the Asian economic crisis and the political turmoil in the country, causing the company distress from significant depreciation of Rupiah currency against US Dollar, resulting in turbulence in the company’s financial condition, and for the first time, Tempo Scan suffered a loss. In 1999, however, out of the feeling of responsibility for the company’s reputation and the fate of all its employees, with the basis of hard work and honesty, Handojo S. Muljadi as the President Director of Tempo Scan decided to prepay its foreign loans, including a syndicate loan from international banks (acquired by the company with no collateral) amounted to USD 105 million. The payment was funded by the Limited Public Offering I in 1998, where IDX had agreed on listing the sum of Tempo Scan’s shares as many as 300,000,000, which therefore resulted in a total listing of 450,000,000 Tempo Scan’s shares. In 2003 as an anticipation for the fast growing information technology in the future, Tempo Scan Group implemented Enterprise Resources Planning (“ERP”) SAP, to support the operational activities of Tempo Scan Group to make it more transparent, efficient, and effective. And now after 15 years of implementing ERP SAP, almost all business lines of Tempo Scan Group have also implemented it. By the trust that Tempo Scan Group has in the capability of the generation of Indonesia to build manufacturing industry in this country, with the hope that Indonesia can be less dependent on products imported from other countries and earn more benefits, a new pharmaceutical factory was built in EJIP Cikarang and has been operating since 2005 on a total area of 76,105 sqm. In 2007, as a commitment of Tempo Scan Group to expand its business network to other countries especially in the Pacific region, an international business division was set up. It includes, among others, International Beauty Products Ltd., Thailand in 2007, Tempo Scan Pacific Philippines in 2010, and Tempo Scan Pacific Malaysia in 2012. Along with the continuous business development of Tempo Scan Group, the offices of Tempo Scan Group moved to Tempo Scan Tower at Jl. HR Rasuna Said, Kav 3-4 Kuningan, South Jakarta, Indonesia, consisting of 30 floors and 4 basements with a total area of 70,000 sqm, which was inaugurated in March 2012. Next, as a fulfillment of the responsibility and the will to bring benefits to the Indonesian people, especially those of low economy group with children, in 2013 Tempo Scan Group built IS0 22000 certified powder and liquid milk factories. They produce Vidoran branded baby milk and child growth milk products to be sold at affordable prices, in order to help parents with low income get quality child growth milk for their children. In 2017 Tempo Scan Group started the construction of a modern Consumer Products and Cosmetics factory located in Mojokerto, East Java province, which is currently still under construction, and is planned to commence commercial production by early 2019. Up to now Tempo Scan Group has operated a total of 9 factories in Indonesia.